Back at the Galt Community Park on Sunday for the second day of the All World Sports Edge of Darkness baseball tournament, the Walbeck Baseball Academy played the Nevada Mavericks. My only wish for the weekend was to avoid the 8 am games. Unfortunately, for the second straight day, the game was at 8 am. Leading off, Jack was 1 for 2 with a single, a walk, reached on an error, two stolen bases and a run scored. In his first at-bat, Jack hit a 3 and 2 pitch off the end of the bat for an infield single. The ball had a funny spin and landed just pass the pitcher on the right side. He went to second on Cooper's bunt single and stole third. With no outs, they couldn't get him home. Jack ran the count to 3 and 2 and drew a walk in his second plate appearance. He stole second and then scored on Jared's double. In his third at-bat, Jack hit a 1 and 1 pitch to the left side that went through the shortstop's legs for an error. Again, he ended the inning at third. In the outfield, Jack played the entire game in left field. He had one put-out. Behind a strong pitching outing by Marco, Walbeck beat the Mavericks by the score of 9 to 3. Macro is a junior at Jesuit and played with Jack on the Cardinals fall ball team. With a two hour break, we had a big breakfast with the Renterias and the Roesslers at the Velvet Grill and Creamery in Galt. 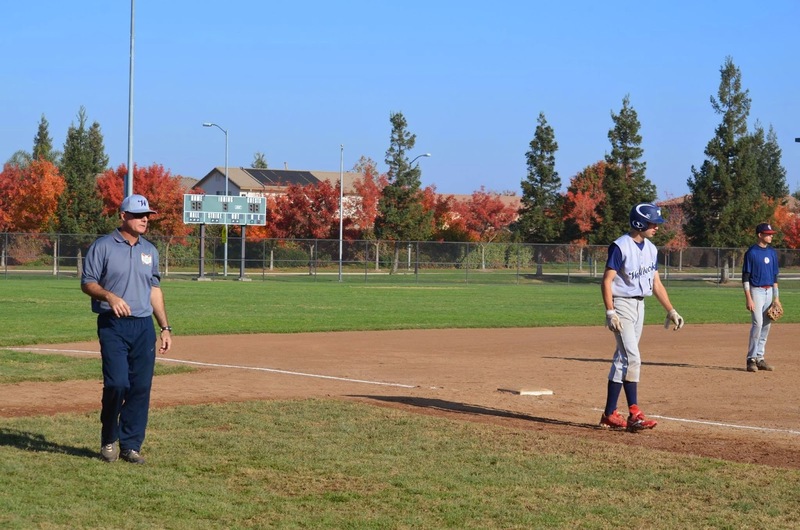 The Walbeck Baseball Academy then played in the semi-final game of the tournament against the East Bay Hackers. They lost to this team in the second game on Saturday. Leading off, Jack was 1 for 3 with a double and a run scored. In his first at-bat, he struck out swinging on a 3 and 2 pitch. Jack crushed a 3 and 2 pitch for a double to the right center fence in his second plate appearance. He went to third on Cooper's single and scored on Jared's sacrifice to center. In his third at-bat, Jack crushed a 0 and 2 pitch for a very hard line drive right at the right fielder for an out. In the field, Jack played the entire game in centerfield. He had two put-outs. I would have charged him with an error. With the game tied at 2 to 2 in the fifth inning, the bases were loaded with no outs. With the infield drawn in, a grounder was hit back up the middle. Two runs scored. Jack fielded the ball in shallow center and threw to third in time to get the runner trying to go from first to third, but the throw was high and sailed into the dugout. Walbeck ended up losing the game by the game of 7 to 2 and was eliminated from the tournament. The Molina Marauders [who Walbeck beat on Saturday] ended up winning the championship by the score of 2 to 1 over the East Bay Hackers. Jack had a great weekend. He hit .444 [4 for 9] with an on-base percentage of .583 [7 for 12]. Jack also reached base twice on errors. As result, he was on base 9 of the 12 times that he came to the plate.